Dr. Sanity: TRICK OR TREAT? Less than a week after Halloween, the American electorate is scheduled to make a decision about what vision they prefer for America for the next four years and beyond. One vision is based on a trick; an illusion (verging on a delusion) that asserts that more government control; more government spending; in short, MORE GOVERNMENT CONTROL over all areas of your life is the cure for our rising debt; rising health care costs; a declining economy; and a declining relevance in world events. This vision promises lots of free stuff to those who believe in it, and these believers are secure in the knowledge that the rich are not paying their fair share and when they are forced by Obama to do so, the free goodies will never ever run out. The majority of Democrats have bought into this leftist utopian fantasy. Obama is betting everything on it and doubling down by using trickster rhetoric that divides Americans into rich/poor, black/white, Hispanic/white, religious/atheist; male/female; gay/straight--any possible division that he can come up with. His supporters may scoff at the idea that he is a socialist, but his rhetoric is Marxist to the core, and that is his plan for America. Romney and Ryan, by contrast, are a relative "treat." Personally, I have no illusions about Republicans and debt--Republicans in congress are as much to blame for our situation as Democrats. Nevertheless, Republicans at least express a deal of shame about it; and Ryan has been consistent in his leadership of dealing with debt, entitlements, and the fiscal catastrophe facing this country. His selection as VP candidate by Romney, in my opinion, was genius for two reasons: first, it demonstrated Romney's committment to fiscal responsibility and entitlement reform; and second, it showed that Romney knows how to pick quality people who can get things done. Both Romeny and Ryan appear to clearly understand the impact the burgeoning debt and collapsing economy will have on the next generation of Americans who will inherit it; and on America's future as a world leader. So, what will it be? TRICK or TREAT? 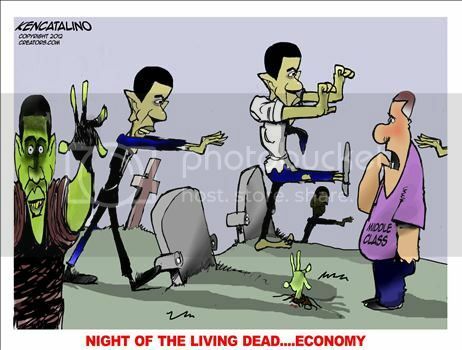 The Night of the Living Dead..Economy; or,The Pursuit of Happyness ? The former being a horror movie and the latter being a tale of personal success (You DID build it!). It's up to you. So make sure you get out and VOTE. Romney's going to win in a landslide. But the election is just a battle in the middle of a 100 yr cultural war we are fighting. Entitlements, education, far too much government and returning objectivity to the media are the battlegrounds in this war for America's soul. If Republican's fail to gain a majority in the Senate it will greatly hinder what Romney can accomplish. The left will do all it can over the next four years to sabotage Republican efforts. Even with a majority its going to be BushHitler all over again. With a majority Romney can eliminate the Dept. of Education, Energy and the EPA. He can end funding for NPR and PBS. Entitlements can be tied to incentives to lessen them, such as work for welfare. Fiscal leverage can be applied to revise course materials in classes, to lessen leftist influence in State Universities and Colleges. Conservative investment into gaining controlling interests in publicly held, parent companies of the major media outlets can be secured. Change the media from the top down. Like a snowball rolling down a hill, change will initially appear to be incremental but in but a few decades, the left will suddenly look around and wonder what happened. Wow! I just love your analogy - trick or traet - it seems to fit the situation/choice just so well.